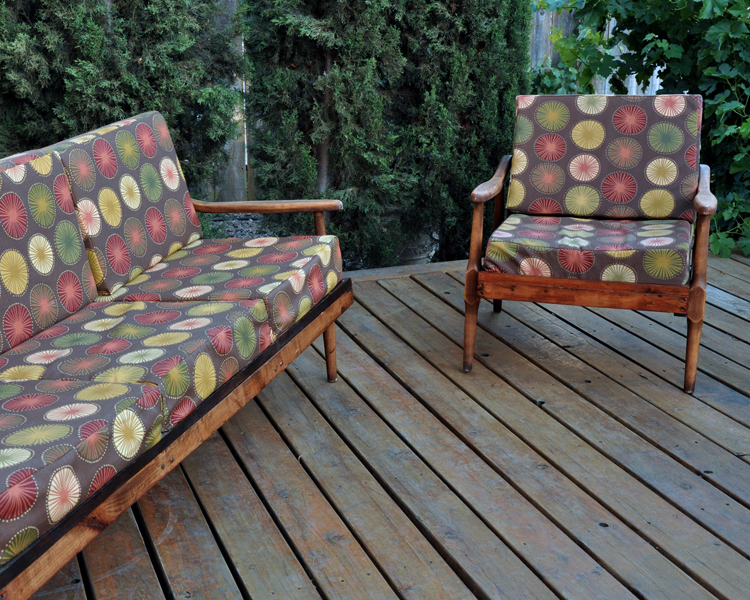 Last summer on impulse I bought this vintage sofa and chair at an estate sale. I loved how it was but had no place for it. I thought it would make a neat patio set for the backyard, which we were in desperate need of outdoor furniture. Of course the only thing was it wasn't really an outdoor set. So... I took on the task of converting it. My initial thinking was since the arms and legs are teak the whole thing must be? All I really need to do is make new cushions with outdoor fabric and foam. Of course once I started taking this damn thing a part, I realized I clearly don't have a clue about how furniture is made. Not only did I spend the next several weeks pulling out staples but I realized that the frame is made of something completely different. In this case it looks like pine. Pine is a softwood that does not hold up well outdoors. Therefore I would have to do some work to make it somewhat suitable for outdoor conditions. 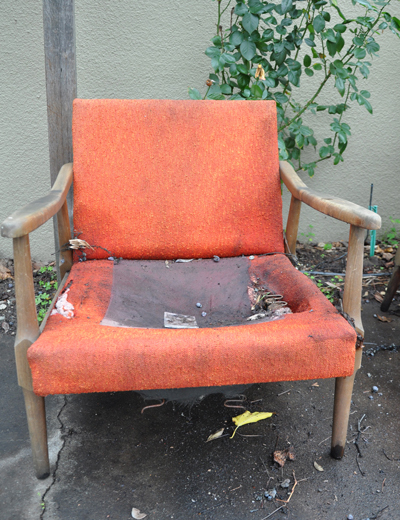 Once I removed all the layers of upholstery (fabric, batting, webbing, burlap) I cleaned up the frame with a bleach mixture to remove any existing mildew. Once the wood was dry I sanded the frame with a fine grit to clean up the frame and remove any dirt or mildew. Then I stained the frame with Varathane Dark Walnut and sealed with 4 coats of Varathane outdoor sealant. For the arms I decide to just clean them up by sanding with a fine grit as well. Once they were clean I used a few coats of teak oil to bring out the wood's natural color and then left them as is. These pieces are fairly basic so putting things back together was fairly easy. Both the sofa and the chair needed extra back support, so we added more wood to the back as well as reinforce the frame for extra stabilization. The chair had two broken springs, so I tried replacing them with new springs. It seemed simple enough but it quickly became tedious and frightening. Frustrated we felt it would be best to just get rid of the springs completely and put in wooden slates instead. 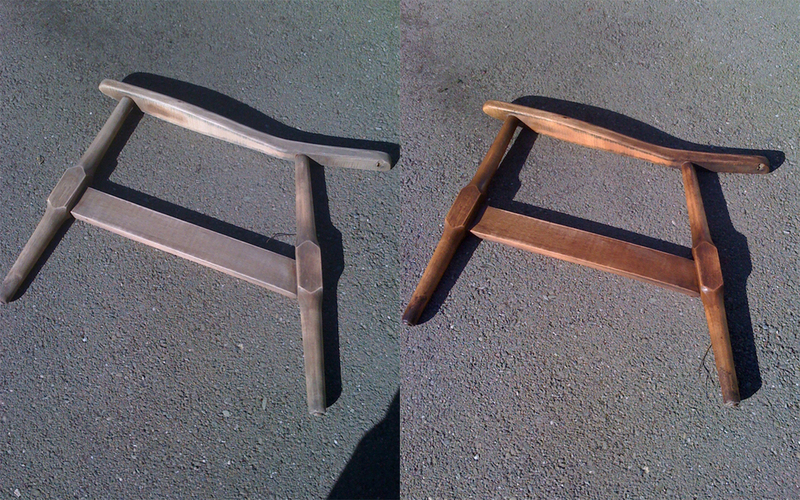 For the cushions, I kept the width and length the same but added more thickness. This was the most expensive part of the project. 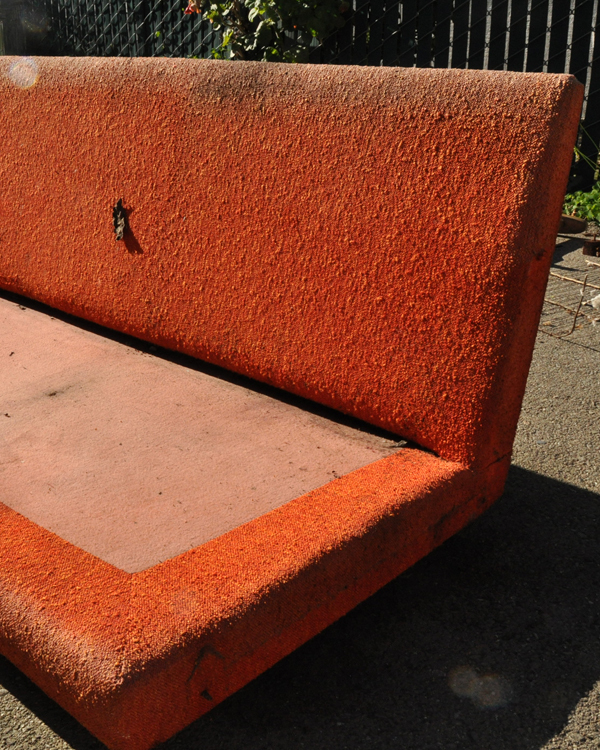 Outdoor upholstery foam is not cheap! My local outdoor surplus store wanted over $50 for one bottom cushion. I ended up using cumulus foam from Cushion Source which cost less then $15 for one bottom cushion plus tax and shipping. For the fabric I went with Solarium because I was not ready to commit to Sunbrella which is a great outdoor fabric but at a higher cost.